The B250 Mining Expert motherboard is specifically designed for GPU cryptomining, supporting up to 19 graphics cards. Asus states that the MSRP is $US130, making it one of the best deals for Ethereum miners. Asus was one of the first companies to announce specialized cryptoming graphics cards back in late June, when the Ethereum mining hype was still going strong. Even though the hype may have died out meanwhile, Asus has just announced the world’s first motherboard that supports up to 19 graphics cards. 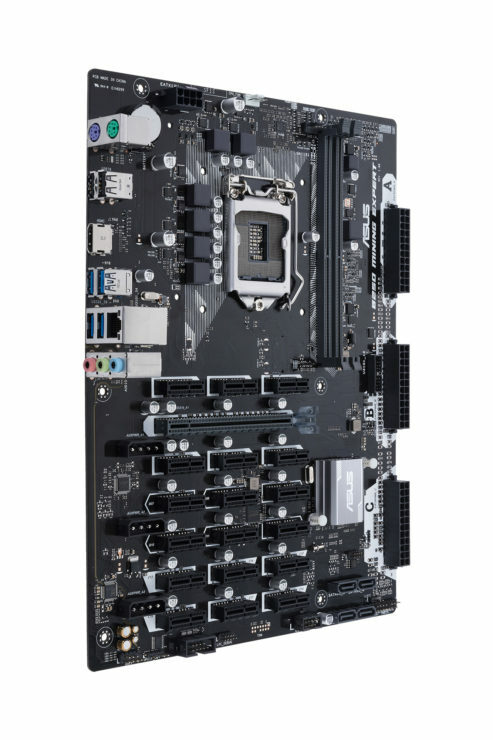 The B250 Mining Expert motherboard is built around Intel’s B250 chipset and features the LGA 1151 socket coupled with a 6 phase DIGI+ VRM to provide maximum compatibility and stability for Intel’s 7th and 6th gen CPUs. There is support for up to 32 GB DDR4-2400 RAM in dual channel mode. As far as cryptomining features go, the B250 Mining Expert motherboard includes three ATX12V power connectors, mining mode BIOS optimization with PCIe Slot state detection, and voltage-stabilization capacitors. There are 19 expansion slots, of which 18 are PCIE Gen 3.0 X1, only one being a PCIE Gen 3.0 X16. These 19 slots are divided into three groups, each group having its own dedicated 24-pin ATX12V power connector. Asus also included a troubleshooting feature that displays a post-boot image of the expansion slots area and shows which slot is populated, making it easy to identify any faulty cards. As of now, the available drivers from NVIDIA and AMD only support up to 8 cards in multi-GPU mode, so users can mix 8 AMD cards with 8 Nvidia cards for a total of 16 cards. AMD announced that a new driver that will enable support for up to 19 GPUs in multi-GPU mode is coming in late 2017. Even with 16 working cards, the B250 Mining Expert motherboard remains ahead of the competition, as the title was previously held by ASRock H110 Pro BTC+ with 13 cards. There is no info on the availability of the motherboard, but Asus mentioned that the MSRP of the B250 Mining Expert should be US$130, a surprisingly low price for the wealth of features offered.